The first time, it was a Blue Jay, hitting my head talons first. Then there was the smack of a Pigeon’s wings across my face as it flew past my head — and wings, by the way, are not as light as a feather. They sting! And the third time was yet another Blue Jay. Joe believes my head has its own gravitational pull; I wonder if the magnetic poles of my head wreak havoc on a bird’s navigational system. Surprisingly, I am not averse to avian antics. But when I stood on a chair to snap a few photos of the nest, and I saw Momma Jay returning, I flinched. You might even say I ducked. Nevertheless, I’m hoping that all of the Blue Jays will be okay — even though odds are that at least one of them will use my head as a perch. “you might even say I ducked” Is that a pun on words or what. I got some photos of a Robin feeding its young with no problem, yet a Robin attacked a Jay the other day in my yard. Perhaps the Robins are nesting near by again. If Jays kill the young of other birds your head just might be in the pecking order especially if it messes with their navigation. The Mom and Pop Jay are very protective. In fact, their dive bombs and mid-air maneuvers would make the Red Baron proud! I know how it is…we have bird’s nests, butterflies, hornet’s nests, wasp’s nests, rabbit’s nests, and I could go on. I love having them there as well. So far, no dive-bombing…I’ll keep my fingers crossed. Welcome to Blotanical! Thanks for the comment! It’s very exciting to be a part of Blotanical! Keep looking skyward. I can sure relate to being hit in the head by birds. When my oldest daughter was a baby, I would go to a park with her in a stroller. And I got too close to a red wing blackbird nest and momma bird swooped down and struck her talons on the top of my head 3 times. I’m sure it looked pretty humorous – mom screaming, baby bouncing – but I tell you that I didn’t venture near her nest again. Hi Audrey. Thanks for commenting and welcome to my gardening blog. After my experience and hearing other stories of “Birds Gone Wild,” I have to believe that Alfred Hitchcock may have beem on to something. Welcome to Blotanical. Years ago, back in our high school days, my best friend and I used to sunbathe on the creek banks. We sometimes argue about the infamous bird bombing that occurred there one day. She says it was I who received the bird poop in the hair, I say it was she. In fact, I’m certain it was she. Either way, it’s fun to banter about the incident some 30, or so, years later. I think there’s a superstition that getting hit with a bird bomb is good luck. I think they made that up to make the bombing target feel better. Thanks for visiting!!! I too was getting ready for spring plantings and found a bird’s nest so I had to change my plans a bit to accommodate the bird. Sometimes, I guess, you just have to let nature have its space. We can always adapt. Thanks for stopping by. Fun post! I enjoyed reading about your adventure. Down here in So FLA, we also have issues with our feathered friends. We have a bird that sounds prehistoric in a tree outside our house. It goes on a rant about 5 am and you wake up going what the heck is that!!!? Between them and the screeching of the wild parrots, we have quite the symphony going on. Thanks for visiting. Up here, we don’t have too many prehistoric screechers — which, with my target history, is very lucky for me. Nice piece, Kevin. Those who don’t dig in the dirt and duck birds don’t know gardening is a contact sport. Be careful out there. Kevin: Yes, there are a lot more than plants coming together with gardening! I love butterflies, birds visiting my garden, but I also once found snakes! It is very nice of you to become a bird-sitter. Those blue-jay babies are lucky to have you! Thanks for visiting my site. 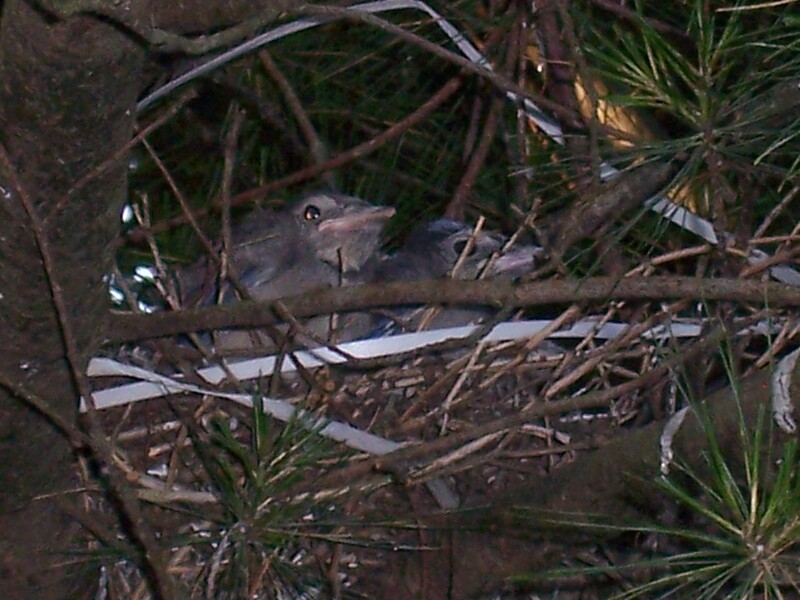 The nest has been empty the past few days, so I think the baby Jays may have earned their wings. They were already quite large when I snapped the photo. When I think of gardening in Florida, I have a mantra (courtesy of a classic Florida gardening book): “Florida, My Eden.” Take care! It’s a shame, because they are a beautiful bird. But I will keep my distance — and my head safely protected. As you say, you only have to provide some shelter and potential nesting sites in the form of trees or shrubs and nature soon colonizes it! It’s truly amazing. When I started gardening, I really was not prepared for all of the wildlife that would be buzzing about.